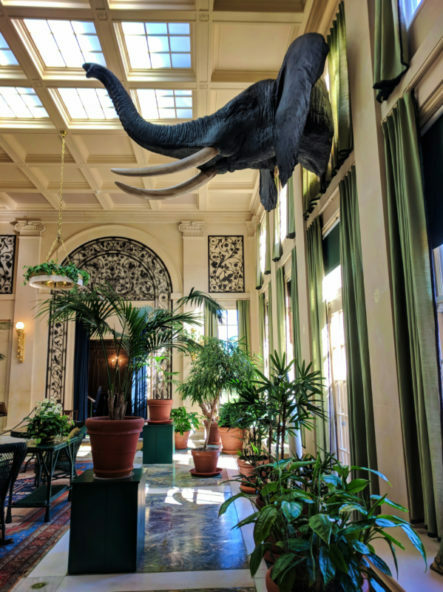 Note: we did partner with Visit Rochester to explore and experience the city, but all opinions are my own and all experiences are accessible to anybody interested in them. No special access. All awesome for everybody visiting Rochester. 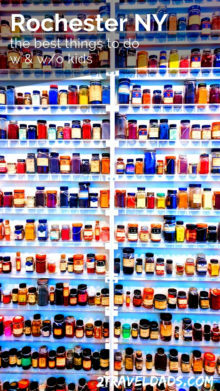 This museum is one of the best things to do in Rochester, NY both for adults and kids alike. 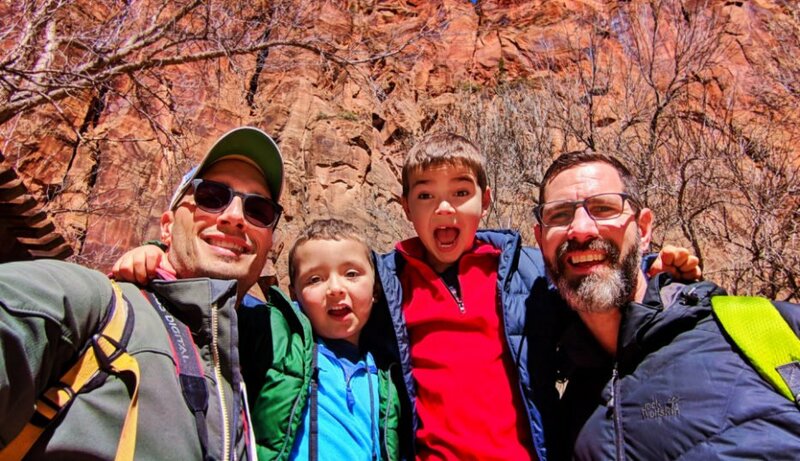 From the parent perspective, I can attest to the exhibits being set up in a way that anyone can learn about the evolution of photography and the process, including kids. As a professional photographer, I loved reading the placards and learning about photo techniques and current leading photographic artists. I think it’s a must-visit. This is NOT a children’s museum. The Strong Museum of Play is unlike any other pop culture museum I’ve ever been to. From start to finish, you’re encouraged to play, to be imaginative, and even to consider how toys and entertainment have changed through the years. 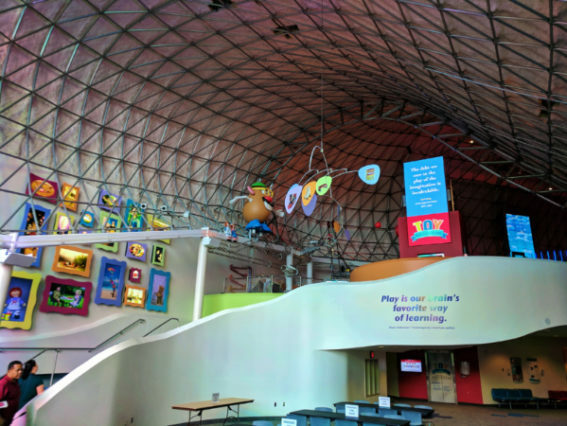 There are a lot of historic and iconic toys, but the real draw of the Strong Museum of Play are the play spaces. From the pinball gallery to huge kinetic toy installations, you kind of lose track of time. The best play spaces though actually gave me goosebumps and at one point, brought a tear to my eye. 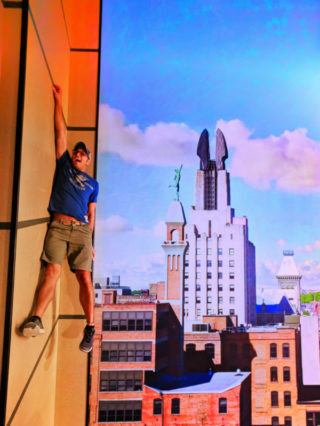 I climbed buildings in New York with Spiderman. 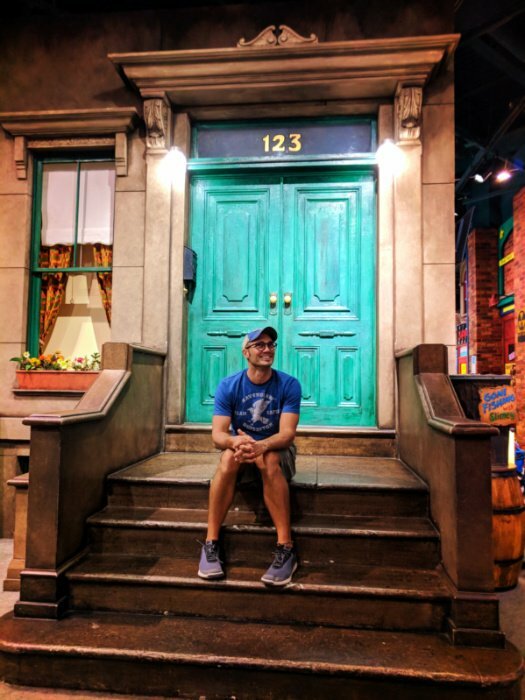 I actually sat on the steps at 123 Sesame Street while Big Bird looked down from above. 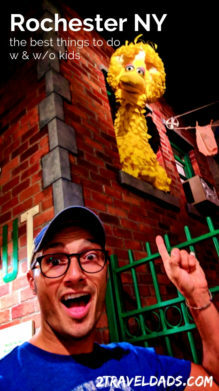 The exhibits and set recreations were an incredible surprise that took me back to being a tiny kid. And I wished I had my kids with me as I explored the Strong Museum of Play. Hours: Monday–Thursday: 10 a.m. to 5 p.m.; Friday & Saturday: 10 a.m. to 8 p.m.; Sunday: Noon to 5 p.m. 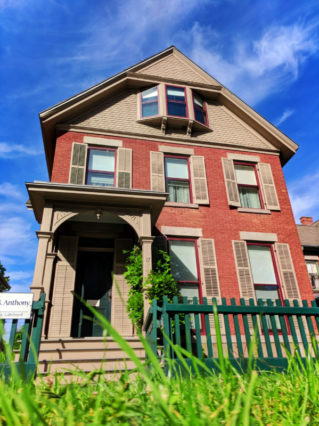 While this is mainly an historic site, the Susan B. Anthony House is also a museum of women’s rights and Rochester history. Wonderfully restored and maintained, the Susan B. Anthony House is a remarkable step into America’s past. 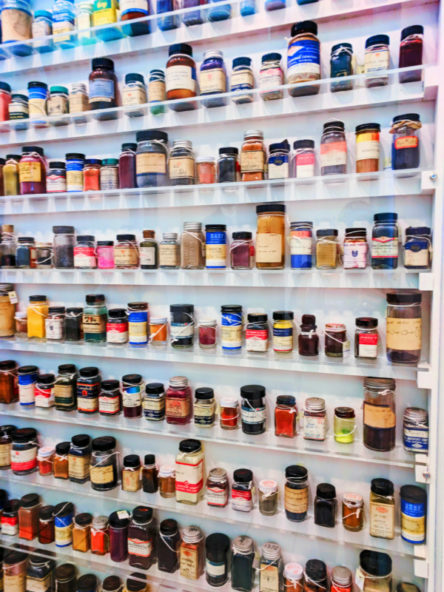 While not a part of the National Parks system, the quality of the tours, the depth of personal information and placement in history, and the unique collections within the house make it a top notch place to visit. 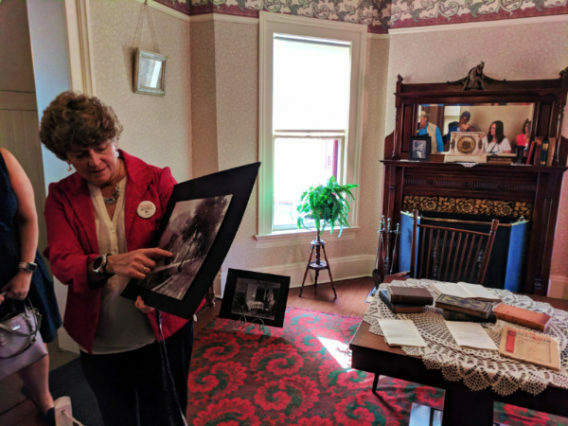 This is one of the best things to do in Rochester for history lovers and people who don’t really know much about voting rights and women’s suffrage in the USA. I’m all about relaxing when traveling, whether it’s scoring some time at the hotel or finding a nice park. Rochester is such a wonderful city to visit because it’s small enough that its bustle is quiet, and big enough that they have infrastructure in place to have created beautiful public spaces. Also, it’s a wonderfully inclusive city, sporting several Pride events and a history of activism and community support. We’re never going to say that another market is as cool as Pike Place Market in Seattle, but the Rochester Public Market comes pretty close. 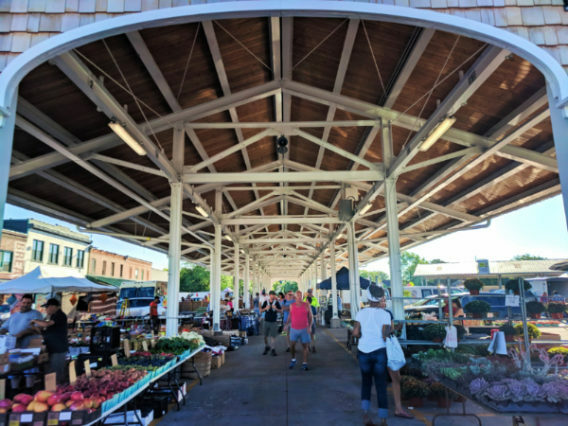 Having been in the same place using the same market structures since 1905, the Rochester Public Market is the perfect blend of farmers, artisans, and foodtrepreneurs. There are over 300 different vendors of all sorts. It’s incredible. I visited early on a Saturday morning and it was bustling from the get-go. Even though I had lunch scheduled, I still walked away with fresh produce snacks, cookies, and a bottle of fresh pressed juice. 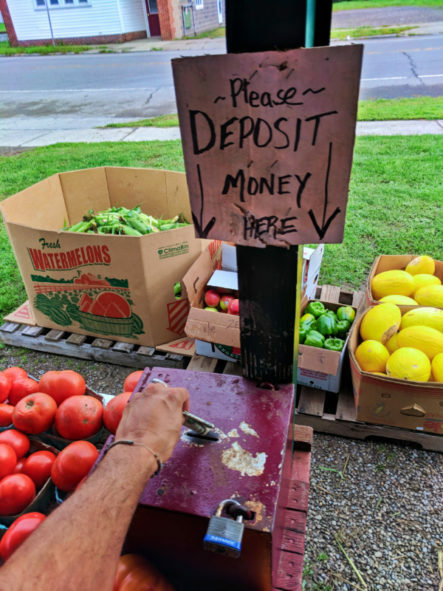 Perfect public market experience. 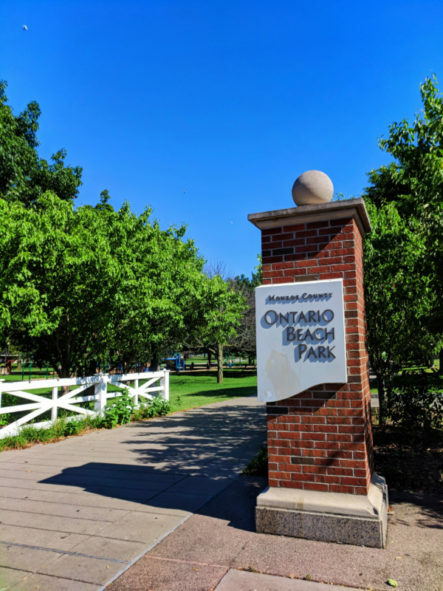 While a stroll through the city in the winter is going to be a chilly experience, the summer is kind of amazing. One of the best things to do in Rochester in summer is to be a part of the city and join in one of the festivals. 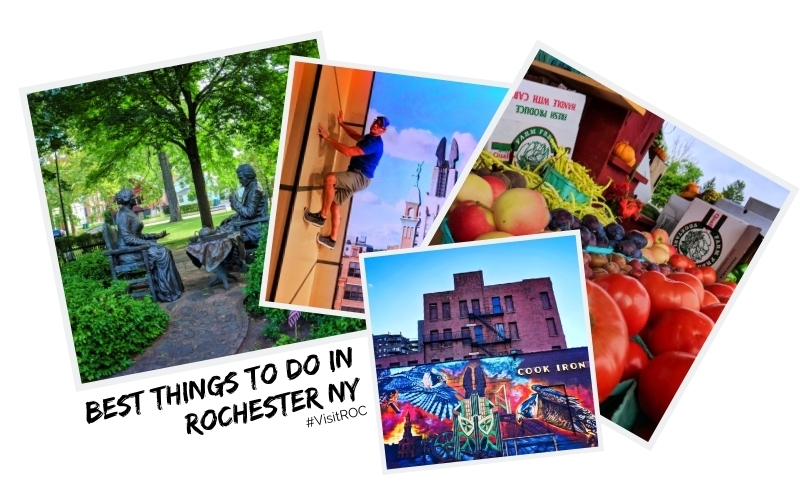 Visit Rochester keeps a calendar up to date with all kinds of happenings, so be sure to check it out before your visit and plan to be a part of the action. 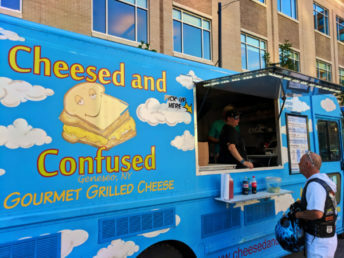 Also, keep your eyes peeled for food trucks, because Rochester is at the top of their game when it comes to the food truck trend. If you’re more of the quiet, relax on your own type of person there are some great parks and squares you can people watch in. 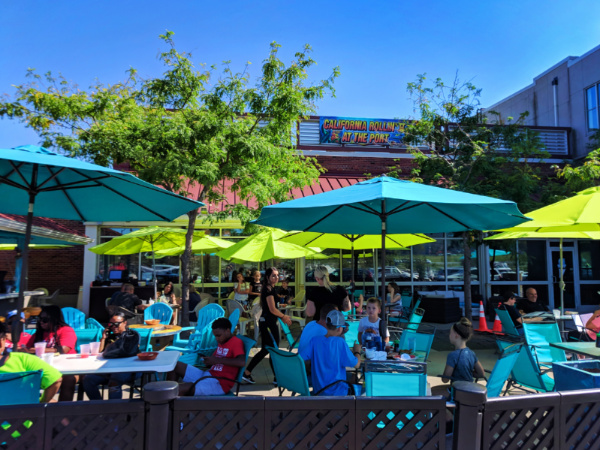 Directly downtown is the Liberty Pole and subsequent square, and just beyond downtown is Highland Park with the Frederick Douglass monument and lots of green space to relax in and explore. 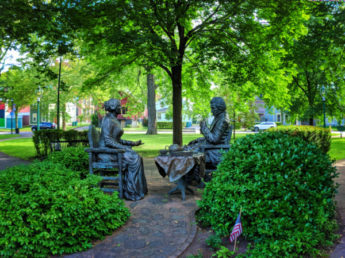 And if you’re looking for another wonderful monument, in Susan B. Anthony Square you’ll find Let’s Have Tea, which is a tribute to her’s and Frederick Douglass’s friendship. Bonus: if you happen to stroll past the Eastman School of Music, you might just get inundated with live outdoor performances from all sorts of talented students and buskers. OMG, there is a huge waterfall in downtown Rochester! High Falls was that random treat that made me realize what a cool city it is. 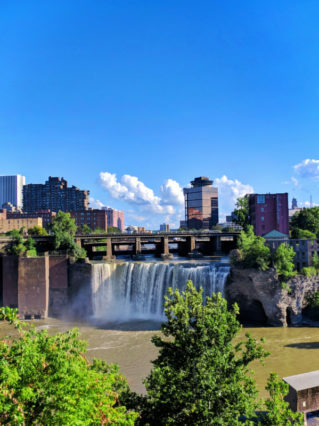 Located at the edge of downtown, High Falls is similar to Snoqualmie Falls in height and flow, but with the city built around it. There are walking trails at High Falls Terrace Park or you can cross the Pont de Rennes Bridge to get a great view and see the east side of the river. 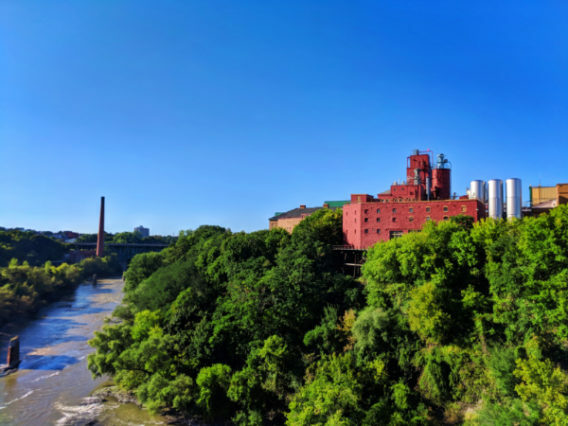 For a fun afternoon activity, hit up the brewery overlooking the falls, Genesee Brew House, and then take a walk across the river gorge. Get a great view and enjoy the local brew scene. 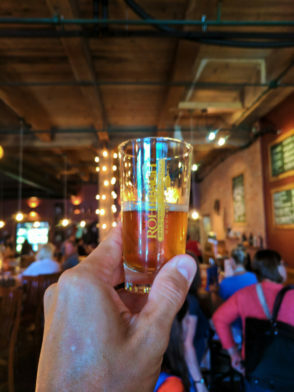 There are quite a few microbreweries in Rochester. The hipster vibe of the city and the student population attending Eastman School of Music, RIT, and other schools keep things young and fun. And that applies to the local brew scene too. 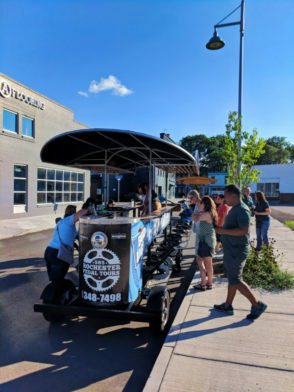 I actually got to do a peddling brewery tour and experience a handful of Rochester breweries in one evening. It was fun AND a workout. A highlight of the peddling brewery tour was actually getting the run-down on much of the city’s street art. 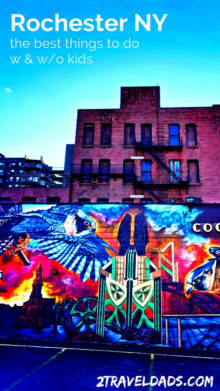 One of the best things to do in Rochester is check out its street art. 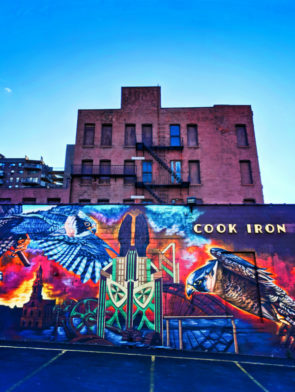 Covering many of the buildings in the neighborhood just north of the downtown core, it really brings Rochester’s industrial past into the now, adding color to the bricks and art to the streets. Across the street you’ll find the marina and actual Port of Rochester. 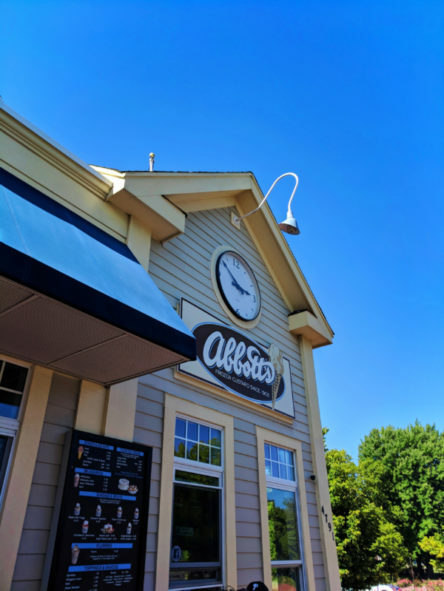 This historic pier is seeing new life with fun restaurants, frozen custard (Abbott’s, so good!) and pathways to explore the surroundings. There’s even a lighthouse above the port buildings (check out the Genesee Lighthouse in peak season). It’s rare that we go on a trip to a city and only stay within its borders. 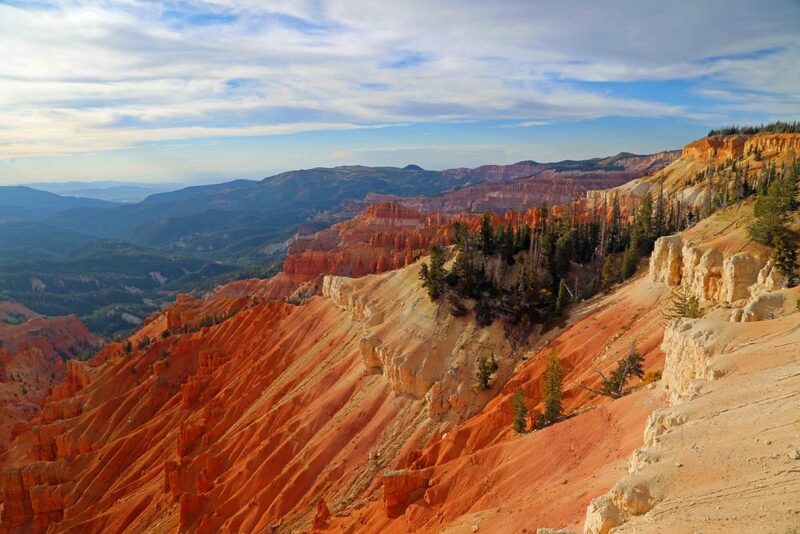 Rochester is great on its own, but there’s a whole world right outside of downtown. 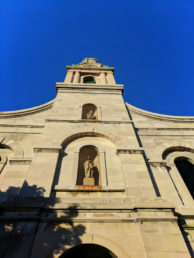 On your way into Rochester from the Finger Lakes region, you’ll pass through lots of cute towns with historic buildings and town squares. One of them is a recreation, both with authentic structures from the early 19th century and replicas. Genesee Country Village and Museum is the Williamsburg of NY. 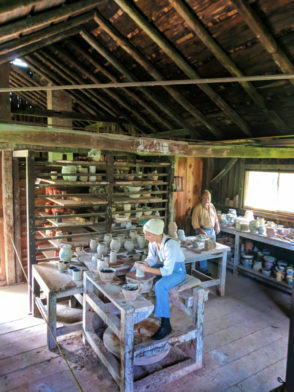 Exploring the village you’ll actually get to see and chat with real farmers and blacksmiths, watch potters making dishes, and even see where they make beer in the hop house. 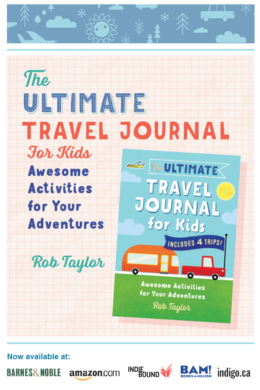 It’s really cool and perfect for kids and adults. 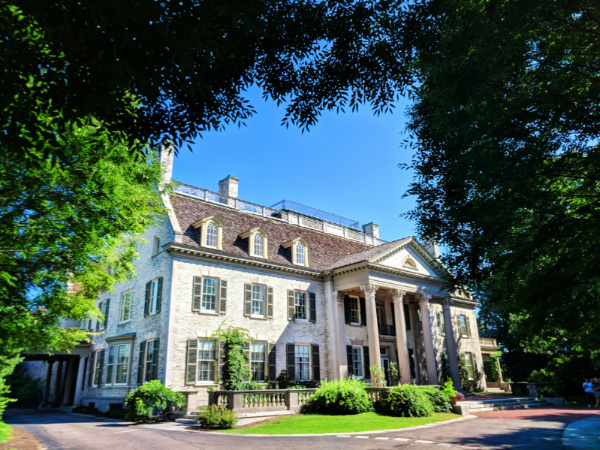 A highlight of Genesee Village is the large Greek revival mansion. 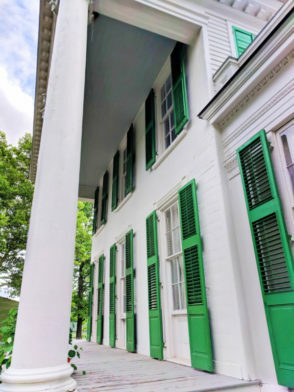 Tour the big house and gardens before you finish your visit, as its unique style and story are just as neat at its green and white exterior. Allot two or more hours to enjoy all of the areas and have enough time to talk with the actors and historians. Like I said, put me on a boat and I’m happy. The Erie Canal is a feat of engineering that I didn’t realize was as amazing as it is. 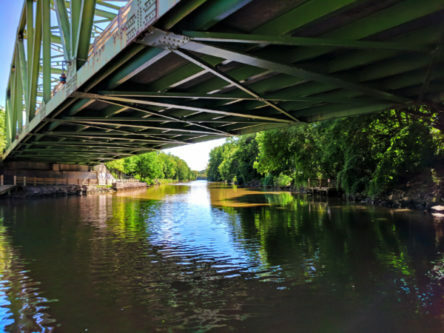 Stretching from Lake Erie to Albany, NY, a full 363 miles, the Erie Canal has been an important part of New York history and industry since 1825. Today, it still connects the small towns built along the canal and is actually a vacation destination. You can rent houseboats and sail the canal yourself, going through locks as it lowers or rises in elevation. I got to do just a day trip along canal, but would have loved to do more. 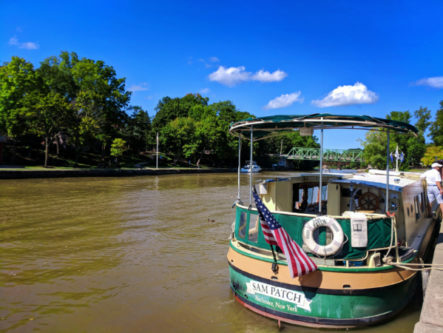 Lunch or dinner cruises are an option if you want to spend time on the Erie Canal but don’t have several days for boating. Getting some relaxation and being a part of history on the canal is definitely one of the best things to do in Rochester. Note: the Erie Canal is an historic landmark and is actually a part of the National Parks system as a National Heritage Corridor. 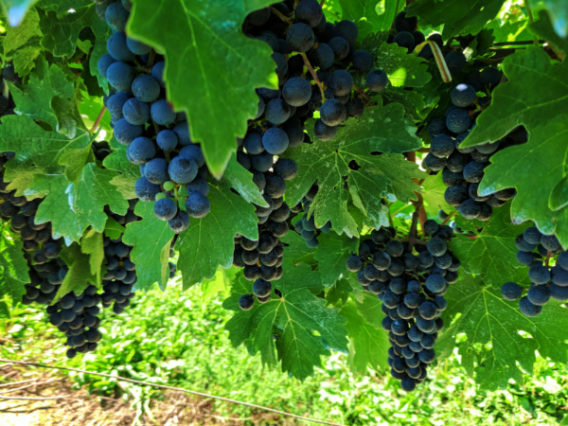 Finger Lakes wine country is just to the south of Rochester, so naturally that wine producing culture extends to the suburbs. 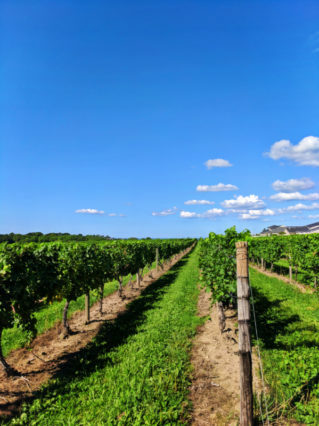 While you could spend several days exploring the Finger Lakes, from Rochester to Ithaca, NY, you could also just do a day trip to the local wine route. There are plenty of tasting rooms, but also full estate wineries that you’re welcome to explore. We visited the Casa Larga Winery just outside of Rochester and loved their setup. Between hay rides out into the vineyard to a huge tasting room to accommodate the weekend crowd, it was an exemplary wine country visit. 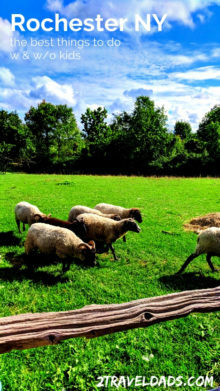 Even though farming seems like such a normal, everyday sort of thing, getting to relax and explore a farm is lots of fun. If you’re fortunate enough to visit at the end of summer/beginning of fall, you actually can enjoy apple picking season. This is also corn maze season, pumpkin season and everything else farmy to enjoy. 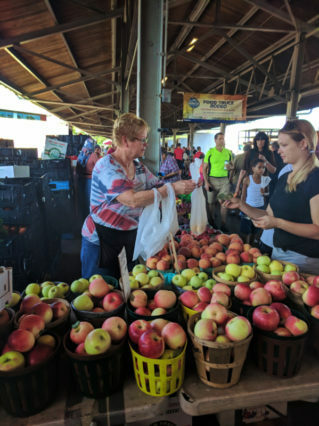 As we road tripped around the Rochester area, we made several stops to enjoy the abundance, including from road side farm stands. 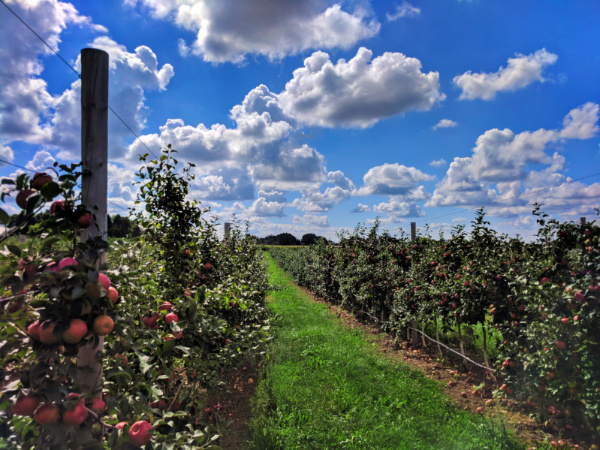 If you’re visiting Rochester with kids, be sure to enjoy apple picking and hay rides. 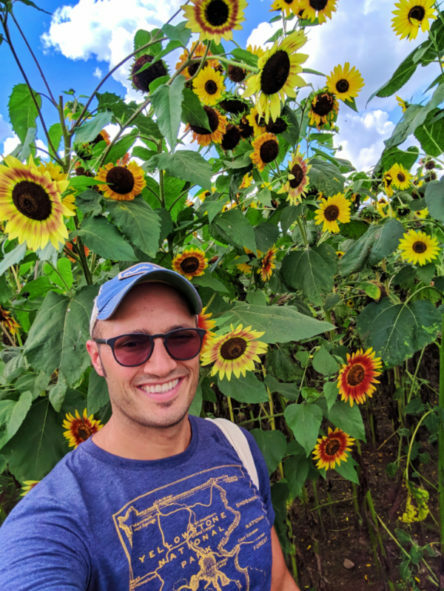 If you’re into it, visit one of the many farms in early September for the sunflowers… and then do your Instagram things with the sunflower fields and their brilliant blossoms. 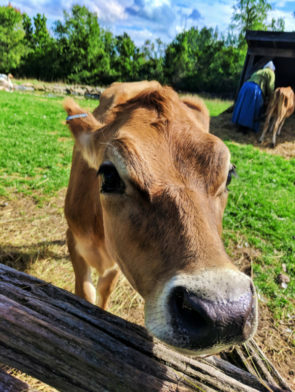 We visited Wickham Farms just outside of Rochester and loved the family-friendly atmosphere. Rochester, New York was really a surprising destination for me. I loved the vibe of the city and the accessibility to calm, beautiful spaces and experiences just beyond the town. 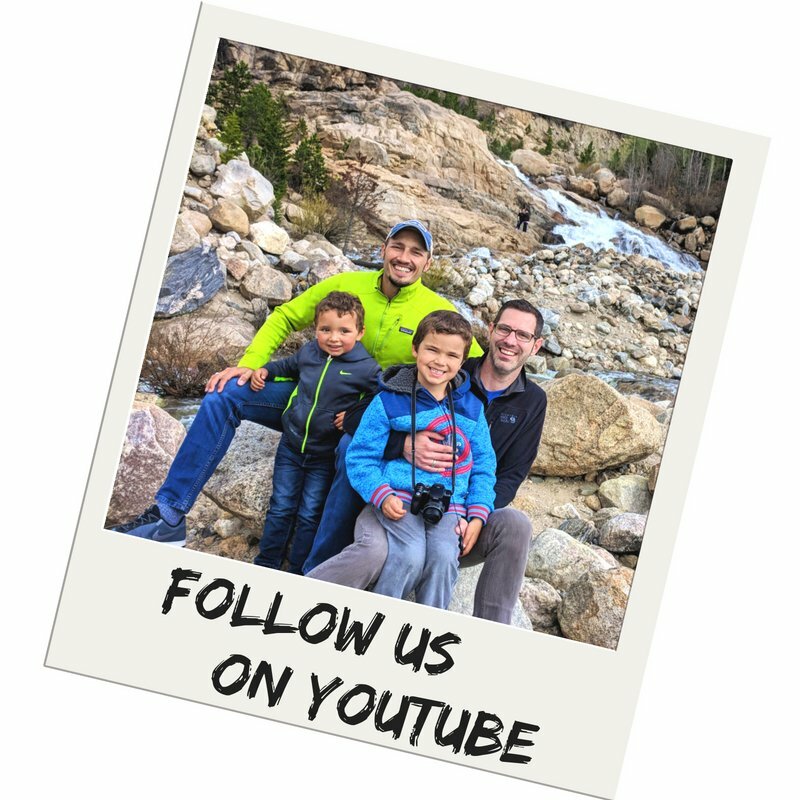 I look forward to returning with the rest of the family and enjoying all of the best things to do in Rochester. 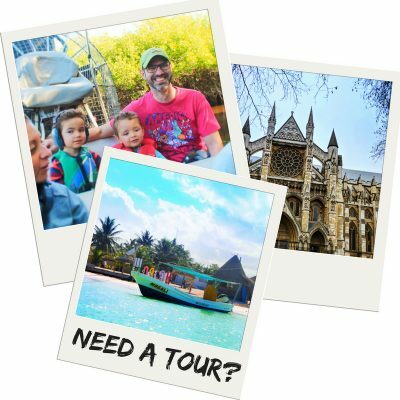 Want to pin this for planning your own trip to Rochester and Upstate New York? Go for it!!! The University of Rochester and it’s Eastman School of music and medical school are amazing as well. Yes! I loved all of the public performances all around the school in the evenings!